Clear and descriptive labelling of items, folders and files is essential to the accessibility of your site for disabled students and more broadly, to the receptiveness of the content posted to support students learning. Users of screen-reading software (software that speaks aloud what is written on screen) download resources based upon their link title and file name. Resources, such as a lecture PowerPoint, should be labelled to include the module, lecture or week number and title, so that it can easily be identified by students, in particular those using screen-reading software. Without descriptive file names, students have to download the file, open it (normally switching to another program and hence a different user interface), and finally skim through some of the content to identify whether it is the content they wish to use. This can be a very time consuming and disorienting process for users of screen-reading software if files are not named descriptively. It could be very difficult for a student to work their way through all their course content if the slides from all their modules were only named lecture.pptx. The table below presents examples for a module called Advanced Learning Design. The students are aware this is regularly abbreviated to ALD, so this has been used in the file name. The good practice examples mean that all resources for a module and week are listed together in a typical file system on a student’s computer. They can also then search by the module, week and topic if required. 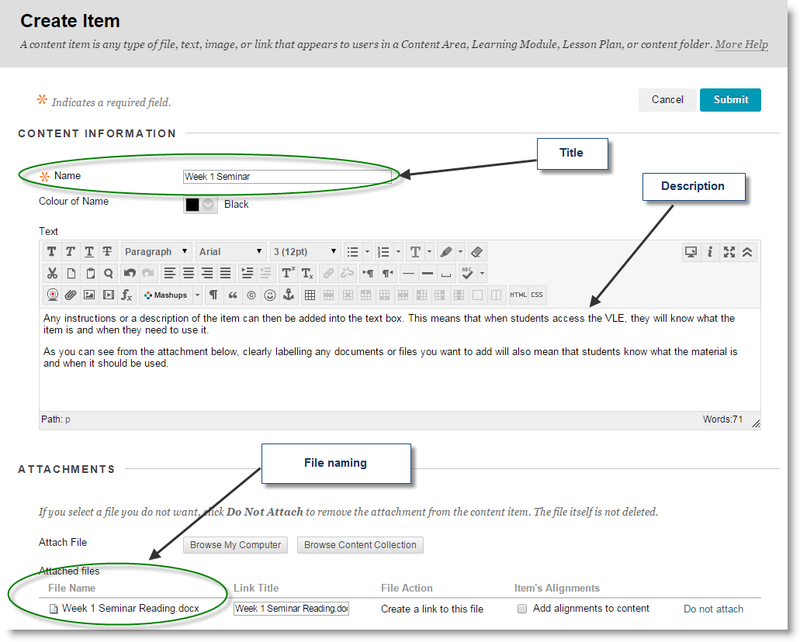 Item, folder and Yorkshare tools all have a common creation form (shown above) that include space for a title and a description. Titles create the headings on a page, which are navigated by disabled students with screen-reading software and act as the visual cues that users will look for when viewing web pages to identify content of relevance to them. Consistent titling speeds up how students can use sites, for example by using week numbers or tool indicators as prefixes. The table below presents examples of titles of items and tools. Use the description to provide context and instructions for resources and learning activities. The description is the primary place for instructional guidance on how and why resources should be used. The description is also a space to supplement the title field with further information to support students’ use of resources. The description acts as another way for students to check the content and relevance of resources prior to downloading them. For example, an item that links to the lecture slides for one week’s teaching could include a description of the learning aims that week or summary of the lecture. The description would not need to be written from scratch, but simply copied and pasted from the introductory slide in the PowerPoint.